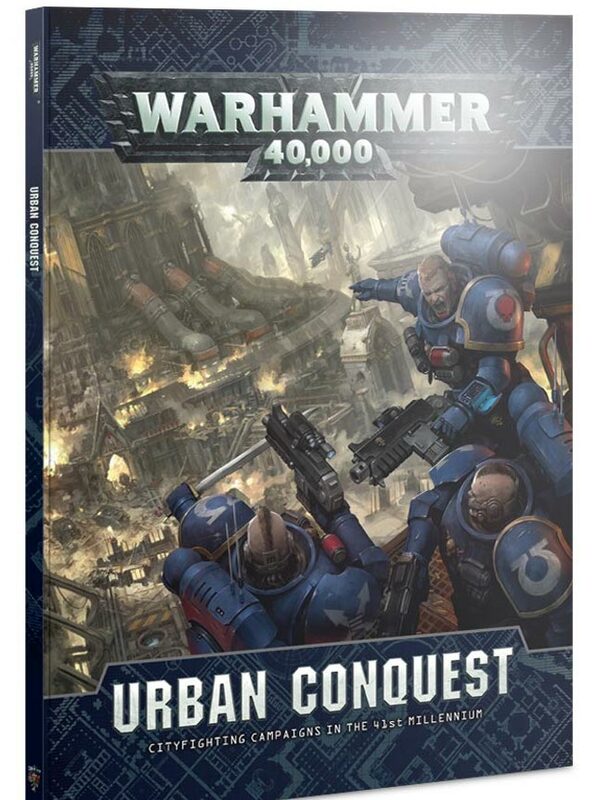 Now that we’ve got Urban Conquest, we’re taking a look at the rules for the Key Buildings and their special Stratagems along with some of the other Stratagems you’ll find in the book – How will you spend those Command Points?! The “Map Campaign in a box” from Games Workshop is just what you need to kick off your very own map campaign. To go along with the custom city map, you also get access to a load of new stratagems as well as 6 new “Key Buildings” that provide you with something to fight over. Today, we’re showcasing 3 of those Key Buildings as well as an entire page of the stratagems. Not only do these 6 Key Buildings have a custom missions for you to use when fighting in those areas (if you choose to use them) they each provide you with some in-game benefits. Now, these zones also have some pretty particular special rules to match just so they don’t make the battles completely lopsided. The rules do limit the Key Buildings as objectives, but they can also provide you with some powerful stratagems. Ammunition Cache providing units with Re-roll 1’s to hit is basically like having a Space Marine Captain nearby. Power Screen Projector give you a 4++ invulnerable save vs ranged attacks for units that control it. And the Scatter Field Generator prevents units from “deepstriking” within 18″ of it! That’s a pretty BIG footprint on the tabletop. With powers like that, it’s no wonder that GW put some reasonable limits on these objectives/stratagems. The book contains a ton of Stratagems and it’s a nice consolidated list of stratagems that you can use in games. Some of these we’ve seen before in some form or fashion while some are new twists. Below you can see 7 of the stratagems from the book – and there are lots more where these came from. 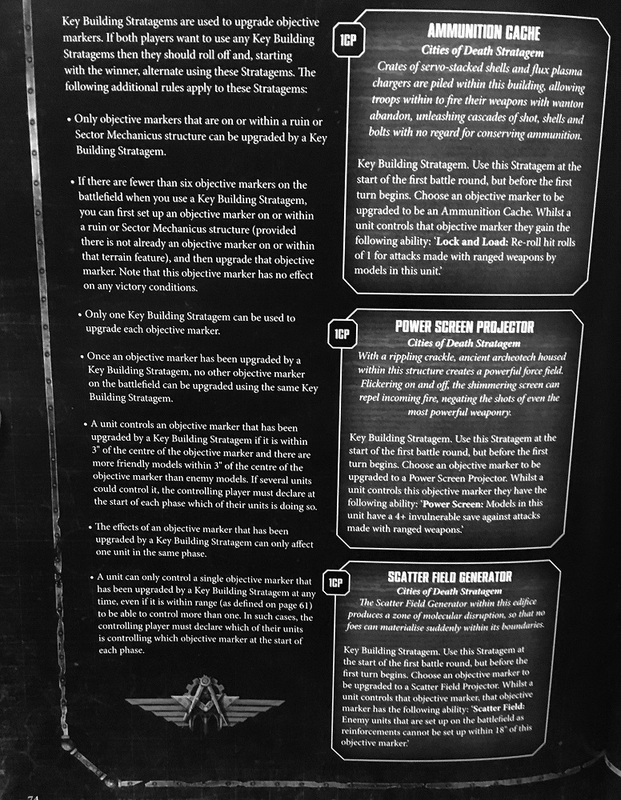 Siphon Promethium doubles the range of flame weapons and adds 1 to their to-wound rolls. Ouch! While the next three stratagems are very much geared to be used in a City Fight with multiple levels to gain a height advantage. Plunging Fire increases the armor pen of weapons when shooting from above while Long Bomb doubles the range of a Grenade attack. Siege Armour ignores any benefit to armor pen for attacks made from above – seems pretty handy considering most vehicles can’t exactly go up floors in ruins. There are lots more stratagems contained in this book as well as rules for all the City Fighting shenanigans you can handle. If you want to take the fight to the streets, then this supplement is for you! The Streets will run red with blood! Unless you’re fighting Greenskins, then I guess it’s green? And I don’t even know what color Tyranid bio-fluids are… is neon an option? !